Within the framework of the 2017 Italian G7 Presidency, the Ministry for Environment, Land and Sea, in collaboration with UN Environment (UNEP) /Mediterranean Action Plan, organized a Workshop on Marine Litter. 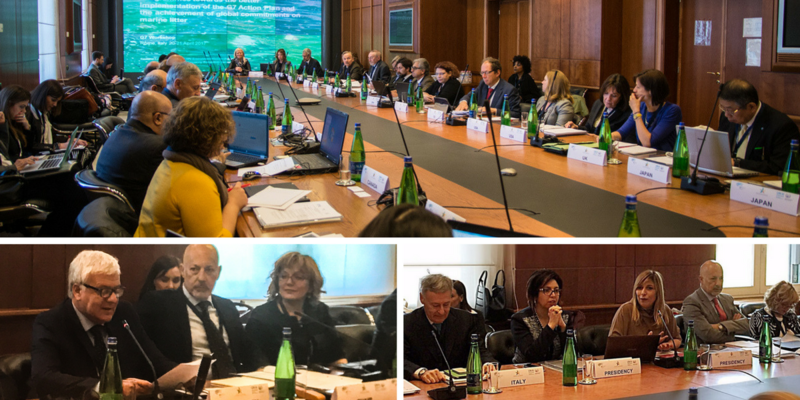 The event was held in Rome on April 20-21 to discuss the implementation of the “G7 Action Plan to Combat Marine Litter” , signed in June 2015 during the German G7 Presidency. The workshop, attended by Minister Gian Luca Galletti and Undersecretary Silvia Velo, addressed various aspects of the marine litter problem, mainly caused by plastic materials: over 300 million tons of plastic are produced every year, of which at least 8 million leak into the sea, accounting for about 95% of the pollution of coastlines and ocean floors. Various measures have already been taken at national, regional and global levels to solve and prevent the problem: at a global level, during the G7 summit in Elmau (Germany, 2015), the G7 countries formally agreed on an Action Plan that recognizes the social, economic and environmental impact of the problem. The Plan was then resumed at the G7 Environment Ministerial Meeting in Toyama and in the 2016 Ise-Shima G7 Summit. During the Rome workshop, particular attention was paid to analyzing regional initiatives to facilitate the implementation of the Plan and to studying good practices at regional and national levels, regarding in particular the plastics and fisheries industries, the monitoring systems and the promotion of the recycling culture. Useful input emerged from the discussion for the future implementation of the Plan, which will be resumed at the 2017 G7 Environment Ministerial Meeting, in Bologna on June 11-12.